Equipped with a membrane to protect against water and dust, Sensiron’s SHT85 temperature and humidity sensor is available from RS Components. 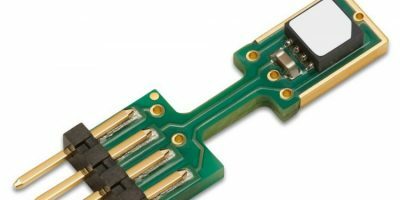 It has a pin-type connector for easy integration and replacement and offers thermal coupling to its surrounding environment as well as decoupling from potential heat sources on the main processing board. It meets IP67 rating and can operate in harsh environments. The membrane protects the sensor opening from water and dust with the response time of the relative humidity (RH) signal unaffected. The SHT85 offers a calibrated, linearised and temperature-compensated digital output. It also has final product level testing to deliver a typical accuracy of ±1.5 per cent (RH) and ±0.1 degree C, an I²C interface with communication speeds up to 1MHz, fast start-up and measurement time, low signal noise and an operating voltage from 2.15 up to 5.5V. RS Components is a trading brand of Electrocomponents, a multi-channel provider of industrial and electronic products. It offers more than 500,000 industrial and electronics products, sourced from over 2,500 leading suppliers, and provides value-added services to over one million customers, shipping more than 50,000 parcels a day from operations in 32 countries.